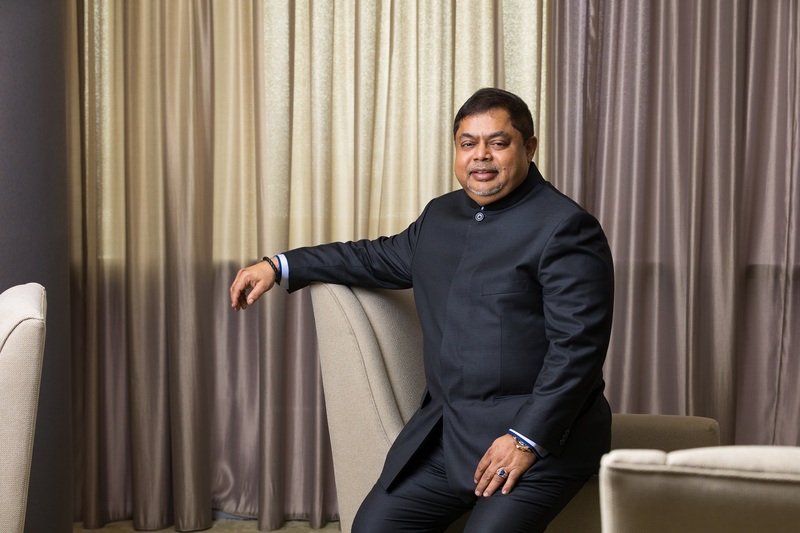 Dato’ Sri Vijay Eswaran, Founder and Executive Chairman of the QI Group, gives up a slice of his packed schedule to talk to Business Today as the group celebrates two decades of growth. Walking into the brightly-lit and cool lobby of the QI Tower in Petaling Jaya, the first thing one would notice is the life-size statue of Mahatma Gandhi captured in motion, dressed in loincloth and grasping a walking stick. It is a beautiful sculpture in its simplicity, and a sign of what’s to come. Dato’ Sri Vijay Eswaran, Malaysian success story, born in Penang to a civil servant father and a schoolteacher mother, is a devoted follower of the principles and ways of the late iconic Indian leader; as Eswaran and his phalanx of sharply-dressed CEOs and Deputy MDs follow us as we are given a tour of the office, there are more artistic tributes to Gandhi on more walls. Which isn’t too far a description of Eswaran, really. Despite his careful, quiet demeanour, there is evidence to show he, too, is on a global mission to conquer. Adulation and deference follow Eswaran everywhere he goes. The soft-spoken man, dressed in a well-cut charcoal grey suit for our meet, commands the kind of snap-to-attention loyalty and readiness more often seen in, for example, the Oval Office. I mention this to him; after all, whilst waiting for him I was first greeted by his PR team, and a short while later, a trio of his right-hand men, including a deputy MD, a CEO and a Director. They are all charming and erudite; and all of them look as if they’d stepped out of the pages of GQ; Eswaran laughs good-naturedly when I mention this in passing. More to the point, they are all ready and focused, standing close by. In those two decades, Eswaran has hit the high notes and persevered through the low points. “There were times, when we first started, when we couldn’t pay salaries,” he says simply, as we walk past a huge wall festooned with dozens of pictures of him with luminaries such as Branson and Ecclestone. 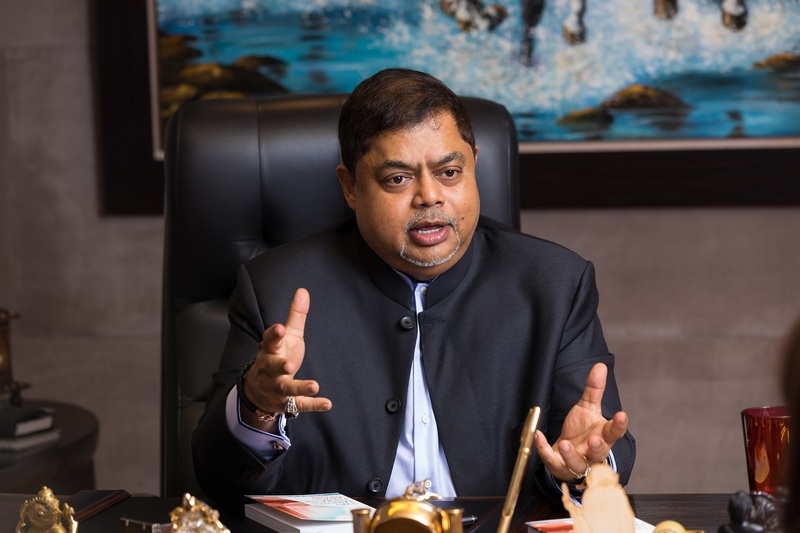 While that entity became QNet, Eswaran’s vast borderless business empire grew steadily and is now rooted in the mothership that is the QI group. The QI group of companies now boasts a wide portfolio of investments and operations that include QI City in the Meru Valley of Perak, home to the Quest International University Perak (QIUP) – “The university is a legacy project,” says Eswaran — condominiums, a hospital spanning 7.6 acres and commercial development just 10 minutes from Ipoh and a total estimated GDV of over RM1 billion. The target is to establish a QI City that will include a new permanent campus, residential block, a teaching hospital to support a medical program, a park, shopping complex and hostel blocks for students. their scrolls at the third Convocation Ceremony last year. The Convocation Ceremony also saw the pioneer batch of 47 medical students graduating, setting a new milestone for the University. 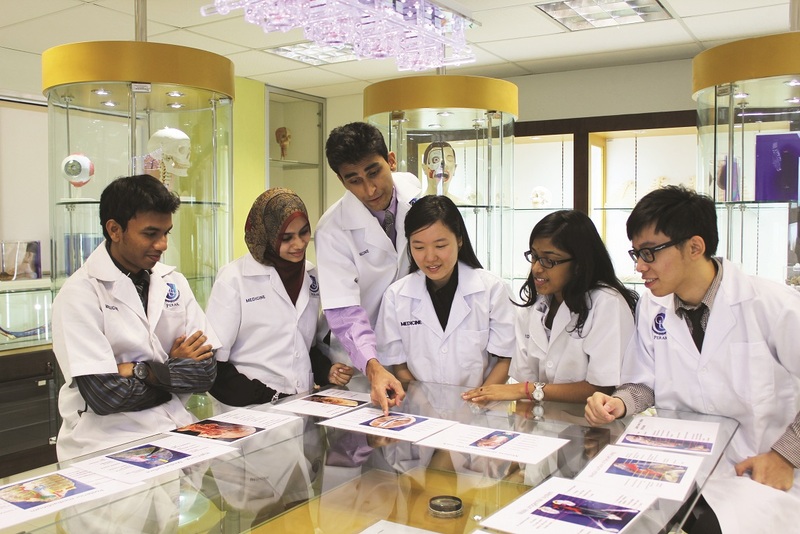 “Certainly, the medical graduates had made QIUP proud and I am very pleased with their remarkable academic achievements,” says Eswaran. The ceremony reflected a huge step forward for QIUP. As a vibrant academic institution, within a short period of seven years, it has made a mark in the academic map of the country. Additionally, QI also owns and operates two beautiful resorts in Thailand, six hotels and resorts in Sri Lanka, a heritage hotel in Turkey, and other hospitality properties in Kuala Lumpur, Phuket and Florida. His appreciation for beauty is evident not just in his business acquisitions, but also in his corporate space. His private collection of artwork as we walk and talk, includes some breath-taking figurative charcoal drawings of Malaysian cultural icons – it is quite the sight to behold. The group has also undertaken sponsorship in Formula One (“an expensive exercise,” says his CEO Trevor Kuna brightly) and now, they are somewhat of a media and advertising partner to Manchester City FC. Why ManCity (as it’s affectionately known), I ask. “Because of the core values of the club,” he says. He admires the club’s dedication to helping children with fewer opportunities realise their potential. And speaking of values, potential and growth, Eswaran has much to say about profits and people. We are sitting in his chairman’s office, a pristine space that is dotted with antiquities in rosewood and ebony. He believes you get what you put out in the world. “It is all about building a team,” he adds. “There are things you can’t write in a CV. Trust, loyalty, integrity — you can’t find these in a CV.” Spoken like a person who has observed many truisms they don’t always teach in business school. And that process of building has seen 16 million customers buying products from over a million independent representatives – IRs, they’re called – who form the vast network of distributors and entrepreneurs selling and distributing numerous products from cosmetics, health supplements, home care products to e-learning courses. Here’s the nub, though: these self-made entrepreneurs who form QNet’s vast network, they are found from Africa to the Middle East to South-east Asia and beyond. This is not your typical suburban neighbourhood network of living-room gatherings peddling plastic containers. When QI begin their 20th anniversary celebrations, they book venues to accommodate crowds numbering 10,000 (Dubai in early September) and 18,000 (in Penang.) Bear in mind, too, the group has only 1500 employees in 30+ offices globally; the rest are all customers and distributors of QNet, as well as friends of the QI Group. This is the kind of reverence Eswaran commands. People wait for a chance to see the man himself in person, even if it means a crowded jostle in a cavernous convention hall. 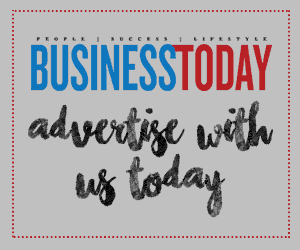 The man has helped and inspired many self-made entrepreneurs fashioned much like himself – the classic self-made business-savvy entrepreneur who understands people are as much of the formula for success as profits. That connections matter as much as cash. 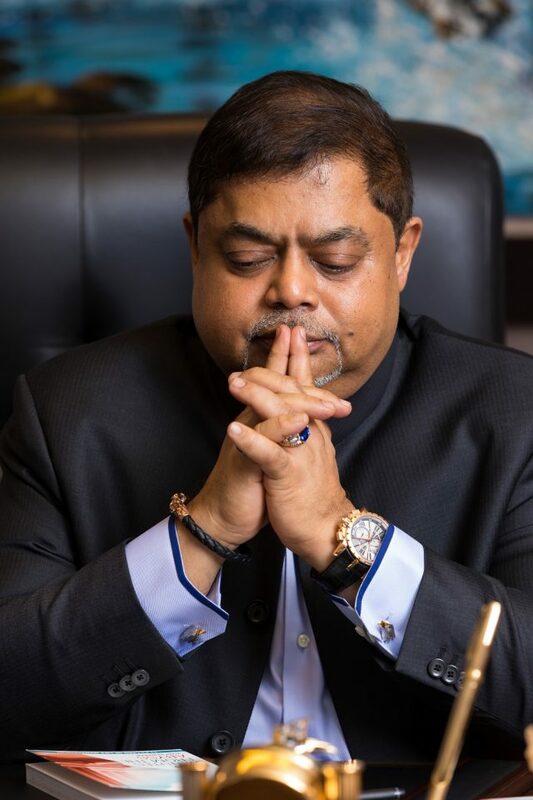 While Eswaran leaves operations to his well-scrubbed and suited-up deputies, he hosts V-Convention, a motivational and networking event that sees 20,000 entrepreneurs in attendance. And when he is not addressing his network of entrepreneurs, he is mingling with leaders at the World Economic Forum, at which he is a regular speaker, and where he was photographed shoulder-to-shoulder at Davos 2018 with greats such as the recently-departed former UN Secretary-General Kofi Annan. We digress briefly from the chat as he gushes about the late Annan, his “fantastic energy” and the work he’d done for humanity. In between all these concrete accomplishments and hobnobbing with titans of the past two decades, he found the time to author not one, but six books. In one, titled Two Minutes from the Abyss, there are nuggets of wisdom such as “When the ego prevails, then all the travails of a nightmare will besiege you,” and the difference between people who are sheep and people who are lions. Peppered in between are anecdotes and charming illustrations, and it is clear Eswaran is a firm believer in the power of the mind, of purpose and of the universal energy that connects us all. on helping disadvantaged communities in Asia, Africa and the Middle East with a focus on children with special needs. Among its many projects, is a Malaysian school called Taarana, for children with learning disabilities. “The jewel in our crown,” as Eswaran refers to it. fatherly towards the end of our meet.